We offer three types of injection molded, flexible rubber state magnets. 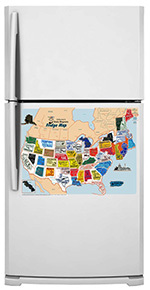 Our 2 color State Shaped Magnets are awesome for helping your child learn geography, including location and state capitals.They can be put in place on our USA map, a static cling display on Sale now - SAVE 35% that can be mounted to your refrigerator or other metal surface. Making geography fun instead of boring. Scroll down to view video. 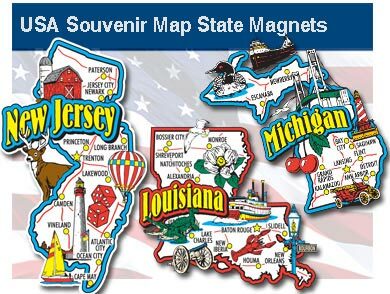 Our USA Souvenir Map State Magnets are big - 9 square inches, 3" x 4" depending on shape of state, and the colors are vibrant! 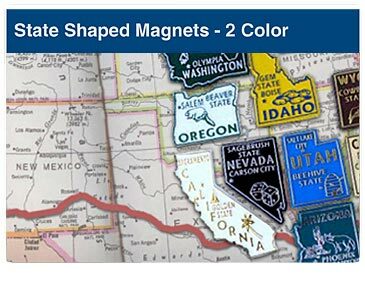 They make terrific mementos of trips taken across the USA.